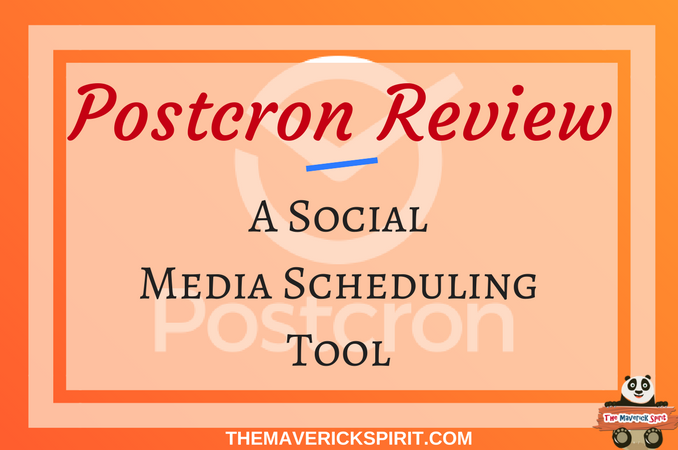 Today, I am posting my review on Postcron – a social media scheduling tool!! But before that, I am assuming you know the importance of promoting your brand on social platforms!! Though the Postcron is a good tool to use. But there is no one to listen to your queries if you ever come across!! I had a terrible time to coordinate with their support team and would recommend you to use SocialPilot instead! Read the complete review and setup guide to know more. SocialPilot has an awesome dashboard and offers great features at very affordable price in addition to this great support team to have your back. To gain visibility with time, you need to reach more and more audience on various social networks but..
..visiting each network and posting your posts in right time is tiresome and impossible task!! How can I automate my social media marketing? You can do this with the help of social media scheduling tools!! ..Here I am sharing details on Postcron which I discovered through Facebook advertisement!! Apart from this, I am using other social media scheduling websites too..
..and later on will post a review or comparison accordingly. Postcron tool allows you to schedule posts on social media accounts. The easiest way to engage your audience, increase your traffic and save time. Freedom to add your logo or watermark to your images. Bulk uploader where you can schedule 1000 posts at once from an Excel or Google Docs file. Adding team members to your account. URL Shortener – Bitly integration. You can Sign up in Postcron for Free!! Once you have logged on to the service, you can see your Postcron Dashboard!! I have already mentioned above all the social accounts that Postcron covers. – Type your schedule post in the given box. You are allowed to write a post of 500 words, add Photos and Smileys. – Plan it on Preferred Date and Time!! Once you are all set with the content! It’s time to hit the Schedule button. When you are scheduling a second blog post-Postcron allows you to add a delay between each post (in minutes).. 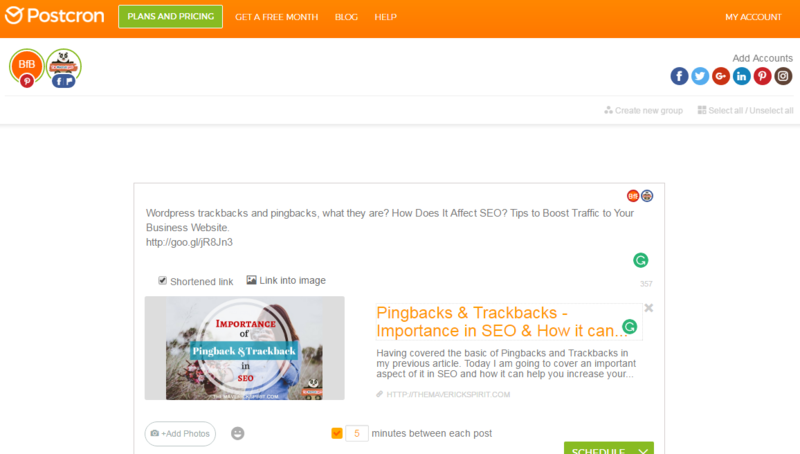 ..Ultimately, you can post a series of tutorials rather than adjusting time and date again and again. You cannot use advanced options or services offered by Postcron social scheduling website in Free plan. adding a Watermark or Logo to the image. searching Photos and People on Flickr. looking for username or any topic on Youtube and Pinterest. get Content Recommendations (by including up to 10 keywords and 10 Twitter accounts). The tool features 4 pricing plans. The minimum plan starts from $8/month and the mega plan is for $88.33/month. On paying yearly for any plan you save 15%. This is it!! I have tried to explain the tool to my best. It’s your time to explore the Postcron scheduling tool now. Using any other social media scheduling tool already?? Share it with me in the comments below. Thanks for sharing. I’d been using Buffer, but Postcron looks good. Is there a free package option and then the ability to upgrade to a paid plan later? You can sign up for Free and use their service!! Later on to upgrade your plan – Just fill in the payment information select a pricing plan within your Postcron dashboard under Account settings. Informative article. I am a social media enthusiast and use Buffer to manage my Social media accounts. Thanks for letting us know about this awesome tool!! I don’t this is a free service is it? Is this new? I tried buffer and tweetdeck when it was still active. I have tested out two sites that allow you to post and schedule many different social media sites. I am not in love with any at this point so I am about to give this a try. Will this work with older posts that you have on your blog? Of course, it will, Patrick! In fact, I’ve scheduled some of my old posts too. Works fine!! This looks interesting. I currently use Hootsuite and Later. I wonder how this compares. not much into these scheduling tools as I have not really looked into it, but seems its high time I did something good and useful on the social media section of my business, so hopefully, I will be looking this through to know more about it practically. Thanks for sharing! It looks like a great service! Hey Ankita. 🙂 Just decided to check Postcron out after reading your cheery review. It’s so smooth! Usually, I prefer Klout, but I feel I’m going to fall in love with this one. Thanks for the review! I see you have not set your Gravatar Image..
..and I would like to recommend that you should have gravatar image as it is good for personal branding. Finally, you did it, Luana! Postcron seems interesting, but is it like free for individual users or is the free pricing for a limited period? Also, do they have an app? – There is no one to listen to you! – They have bad customer support. – As well as the CEO of PostCron doesn’t give any response. Very soon I am going to update this post. Apart from it, the answer to your query is – PostCron is free for a lifetime with limited functionality! I recommend you to use SocialPilot instead which I am using currently. The Free version provides 3 social profiles link up and 10 posts sharing per day. How well SocialPilot helps you to resolve your social media needs? I had postcron for a few days and realized it wasn’t what I thought it was–I asked for a refund and they told me no. Not even a partial refund. I feel like that’s bad business. True Sherri! I wish you would have discovered this post before to save yourself from this situation! They keep you busy by sending emails that don’t satisfy your needs moreover with a delay of 3-4 days. I wish you discovered this post earlier so that you could be aware of the bad service of Postcron support team to its customers. This could save you time and money!